In the first quarter of this year, 2013, Apple shipped 19.5 million iPads1. Samsung shipped 8.8 million, Asus 2.7 million, and Microsoft 0.9 million. With others, this means in just 3 months, almost 50 million tablets were shipped worldwide. Of this, Android comprised 56.5% of the market, iOS 39.6%, and Windows (RT and 8) 3.7%. This means that around 27 million people bought an Android tablet, and almost 20 million bought an iPad, and around 2 million people bought a Windows tablet. There is absolutely no question that people love tablets. When the iPad was announced in January of 2010, there was a lot of hesitation from consumers, because no one really knew why they would get one. Quotes flew, varying from “it could completely replace your pc,” to “it’s just a big iPod touch!” As time passed, the iPad evolved, and competitors arose, people began to realize that tablets have lots of uses, but not necessarily in the places they thought. I work with tablets every day, as a software developer. My company works in custom software solutions, and I also develop in-house software. This means that I am privileged to work with a wide variety of tablets (operating systems and hardware), on a wide variety of projects. I want to write (over a series of posts) my analysis, comprised of both statistics, and opinion, from the (somewhat) unique perspective of an individual who is a user, developer, and technical support rep (for family, and customers), of multiple platforms and devices, including Android (Asus, Ainol, Samsung), Windows RT (Microsoft), and iOS (Apple). Throughout this series, I’ll do some comparison of form factors – 7” class versus 10” class, comparison of operating systems, and comparison of hardware. Throughout these, I’ll cover normal day to day usage impressions, impressions as a developer, and impressions as a person in a tech support role. At the end, I’ll wrap up with some opinions and research on some of the features available (or not) on each platform, as well as some perspective on how your tablet probably causes stress and wastes time, when it could be doing the opposite. I hope you stick along for the read, because otherwise, I’ll just be wasting my time honing my writing skills and paying for hosting. Side notes: I realize that many of the stats about operating system include smartphones, but for the sake of my comparison, I want to stick with analysis of tablets, and stay away from phones. Many of my points directly translate or cross over into phone territory, but I want to stick to tablets because, well, I have 8 of them on my desk. I also realize that these posts might be spam/flame-war bait, but I’m just looking to share my opinions, share some knowledge, and crush some FUD. Haters gonna hate, etc. I encourage anyone who wants to comment to respond by writing your own post about your experiences and opinions. 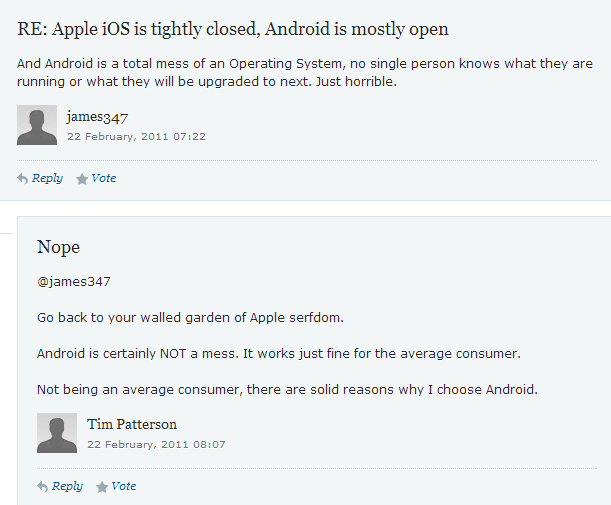 There are enough crappy comment (or twitter) threads arguing about Android and iOS.